My wife's company, Novartis, does an amazing job every year with Bring Your Child to Work Day, they put a lot of resources and manpower into creating an informative and fun day for the kids. This year the focus was on how products are imagined, marketed, and brought to a store near you. People from all different parts of the company spoke to the children and explained what their department did and why it was important to the process. After each "talk" the kids performed different tasks with the goal of producing a cookie that they could sell at the end of the day. All of the proceeds from the cookie sales are being donated to our JDRF chapter so the last talk of the day was from me and Arden. We explained the difference between type I and type 2 diabetes, gave an overview of the JDRF and had a hands-on look at Arden's OmniPod insulin pump and her DexCom CGM. Insulet was kind enough to send me some non working or dummy OmniPods so that the kids could try them on if they wanted to. The day was a wonderful success raising $1,100 for the JDRF, an amount that will be matched by Novartis 100% for a grand total of $2,200! One of the best parts of the day was watching the kids work so hard on their cookie ideas, boxes and then seeing the hustle they all showed selling the cookies. It was while they were selling that I began to really notice all of the OmniPods on their arms and I have to admit that it was a very warming experience to see the children so enthusiastic and excepting of it. If I had enough pods I think every kid in the room would have been wearing one. 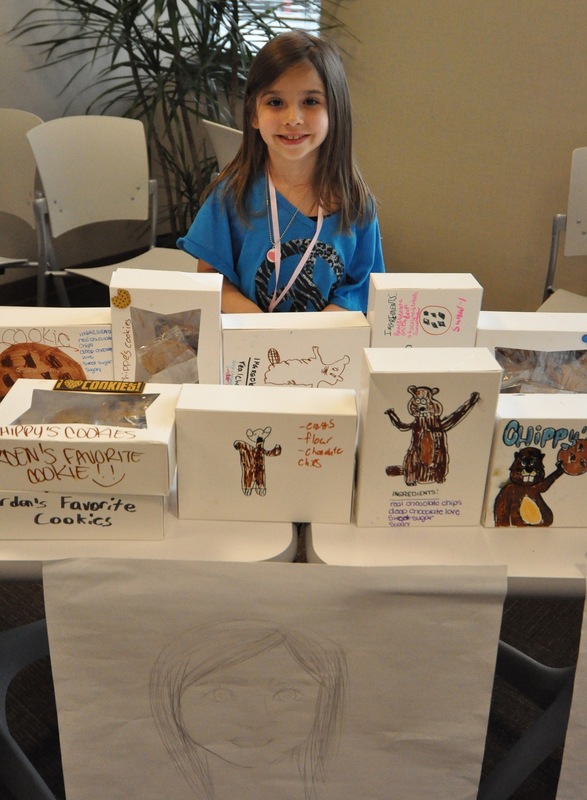 Arden and her team sold chocolate chip cookies and their marketing hook was that they had a celebrity endorsement, if you look closely at the boxes you'll see, "Arden's Favorite Cookies" on the sides. Big thanks to Novartis, my lovely wife Kelly for suggesting that the JDRF would be a great place to send the funds collected and Insulet for sending the pods for the kids to wear. I explained to the children that advocacy and awareness is what people with type I need the most from them and that I hoped they would tell someone about the good work that they did. I was very proud of all of them for the attention, effort and concern that they displayed throughout the day... it was a great experiance for everyone!